This entry was posted on Wednesday, January 24th, 2018 at 12:44 pm and is filed under Community . Meeting on Sunday, Feb. 4th at 3 p.m. in the main hall! Htjeli bi vas sve pozvati na našu godišnju sjednicu koja će se održati na nedjelju 4. veljača u tri sata u veliku dvoranu. 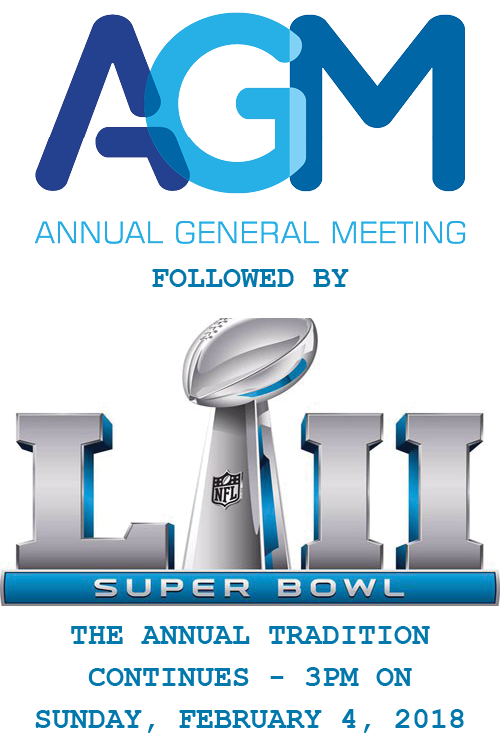 We would like to invite you to our Annual General Meeting which is taking place on Sunday, February 4th at 3 p.m. at the Croatian Sports and Community Centre at 166 Green Mountain Road East, Stoney Creek, Ontario. After the meeting slide over to the restaurant for our Super Bowl buffet and drink specials to watch the NFL’s main event! Come to the AGM, pay your membership, and have a vote. Non-members cannot vote. If you do not know if you’re a member, contact jsgrbavac@gmail.com and he will let you know.